Welcome to our weekly fantasy FLEA market, where we look at the options and make trade suggestions heading into Week 4 of the fantasy football and NFL season. Here are my FLEA market finds for Week 4. Rivers has had an excellent start to the fantasy season with 8 passing touchdowns in three games. He’s tied for third at the position even though his last two games have come against the Bills and Rams that both typically allow fewer passing touchdowns than an average team. I think that bodes well for continued success because Rivers’ schedule is about to get much more favorable. His next two games are at home against the 49ers and Raiders that both allow more touchdowns than a typical team. And Rivers doesn’t face another below-average passing touchdown opponent until he plays the Bengals in Week 14. Take a run at Rivers if any of his owners believe now is the time to sell high. Elliott hasn’t exactly disappointed so far in 2018, but he is well behind the fantasy pace of the best PPR backs like Todd Gurley, Melvin Gordon, and Alvin Kamara. You might be concerned that second-tier production will continue because the once-dominant Cowboys’ offensive line has degraded to just very good. Their 67.5 run-blocking grade is sixth-best among 2018 teams but is still well below their excellent standard from previous seasons. I’m more optimistic. Elliott’s first three games have come against the Panthers, Giants, and Seahawks — all three allow 20 percent fewer rushing touchdowns than a typical team. Elliott could go on a scoring barrage over his next three games. All three are in a dome, two are at home, and the next one is against a Lions defense that allows 35 percent more rushing scores than a typical team and saw Isaiah Crowell and Matt Breida gash them in Weeks 1 and 2. In part thanks to the Lions’ defense, Breida has been much more effective this season than I predicted pre-season. Still, I expect many Breida owners are panicking after Jimmy Garoppolo’s season-ending ACL tear. I actually think the injury helps Breida’s fantasy stock. Yes, the 49ers are more likely to trail big in games and be forced to abandon a balanced offense, but that should skew their backfield workload away from early-down back Alfred Morris and toward the more-versatile Breida. Moreover, new starting quarterback C.J. Beathard is conservative. 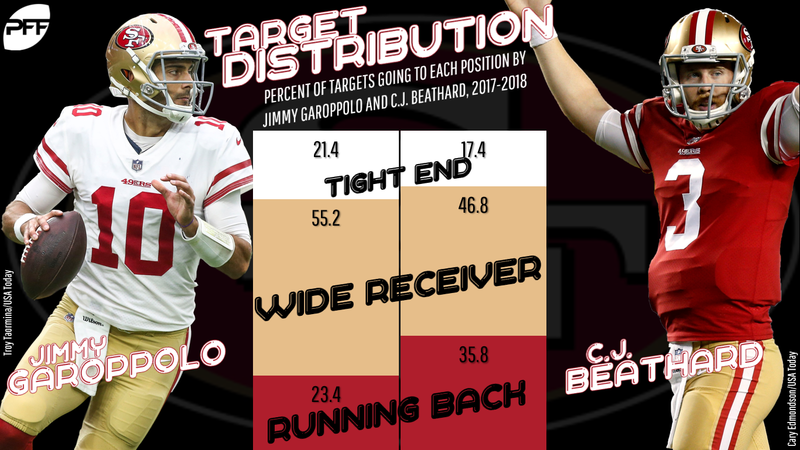 Since the start of last season, he’s targeted running backs rather than wide receivers and tight ends about 50 percent more frequently than Garoppolo has. Whether or not Breida has truly become an efficient back, he should see an increased target volume to buoy his fantasy prospects. Carlos Hyde caught 59 balls in a similar situation last year. Just be sure to keep an eye on Breida’s status for Week 4. He’s questionable because of a knee injury. Assuming he plays this Sunday, Josh Gordon will have a one-week head start over Edelman to make an impact and carve out a role in the Patriots’ offense. But I don’t think Edelman is a great trade target because I expect Gordon to fail. I think Edelman is a great trade target because the Patriots need a lot of help at receiver. Rob Gronkowski has unsurprisingly been the team’s most effective target with 13 Yards Added. But no one else has made much of a contribution, including current starting wideouts Chris Hogan and Philip Dorsett, who have combined to cost the team 17 yards relative to an average receiver. I expect Edelman to see a ton of looks when he returns next Thursday against the Colts. It has yet to translate into fantasy success, but Henry has seen a noticeable uptick in his percentage of the Titans’ carries this season. Last year, he took the smaller end of a 45-55 split with DeMarco Murray in the games they both played. This year, he has the bigger share of a 54-46 split with Dion Lewis. Meanwhile, Henry has continued to be exceptional on his carries with 15 Yards Added this year, fifth best at the position. Between that and the touchdowns he’ll eventually gain because of his major size advantage over Lewis, Henry looks like a clear RB2 to me. Grab him before his fantasy points catch up to his usage. In 2017, Fuller was the biggest beneficiary of Deshaun Watson’s historic rookie performance. And even though Watson has seen his own fantasy production regress in 2018, he is helping Fuller maintain his. A lot of that is Fuller’s own effectiveness. He’s already added 8 yards over his first two games to continue the pace of more than half a Yard Added for every catchable target. Meanwhile, Fuller is seeing heavy red zone usage. He has five targets within five yards of the end zone the last two weeks. That is the recipe for a safe WR2. Traditionally, Andy Dalton’s Bengals have had less room for a second fantasy-relevant receiver than the Texans are currently showing with Fuller and DeAndre Hopkins. But if Boyd continues to be so exceptional, that will have to change. He has added 5 yards on his 16 catchable targets and so far looks far more efficient than more-touted teammate John Ross (-13 Yards Added). Boyd has been a WR2 in September, and I don’t think it’s impossible for him to maintain that standard the rest of the season. Fitzpatrick carries a lot of baggage from a 14-year career with 140 interceptions. But for me, the dots don’t connect from his three-interception loss on Monday to an imminent replacement by the suspension-cleared Jameis Winston. All three of Fitzpatrick’s interceptions were aided by circumstance. The first was deflected up in the air by the unblocked Jon Bostic. The second seemed to be a miscommunication between Fitzpatrick and receiver Mike Evans, who cut off his route in a gap in the zone. And the third was overthrown because Dan McCullers hit Fitzpatrick’s arm on release. This wasn’t Fitzpatrick’s best game, but he remains the No. 1 quarterback by PFF’s grading this season. I expect him to continue to play, and if he does, there’s no reason he can’t continue to enjoy fantasy success. The Bucs find themselves suddenly loaded with quality receivers. Chris Godwin and O.J. Howard are showing tremendous efficiency to join an already dangerous duo of Evans and DeSean Jackson. Their ability to create separation and make contested catches will make Fitzpatrick’s life easier. He is a nice trade target if his owners are overly focused on the outcomes.